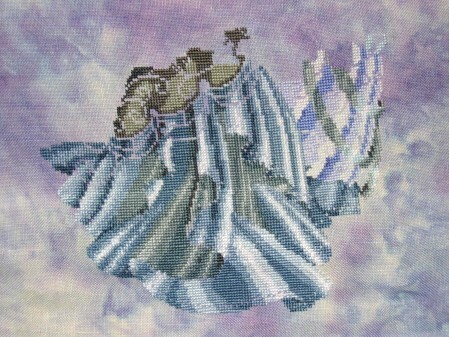 This week I have been taking a break from my Round Robin Stitching for a while and have been working on Stargazer. I am nearing the half way point on the stitching of this. She is really turning out beautifully. I am very pleased with the Silkweaver Starquest linen that I picked for her! I am going to put a little more work into her tonight before getting back into Round Robin mode. I think I have the perfect house picked out for Carol’s neighborhood. The colors look vibrant and beautiful so far, keep up the good work! She is looking beautiful – and the fabric is perfect! Congrats on the progress. Looks great! That is defintely a fabulous fabric choice. She is so beautiful! And the fabric fits perfectly!